Lindsay Wildlife Experience released a fledgling Red-Tailed Hawk in Crockett, Calif., on August 2. The bird was released near the site where it was found, just outside the gates of the Phillips 66 refinery in Rodeo. Workers there found the bird crouched and laying on the ground near the road in June. They brought him to Lindsay Wildlife where veterinary staff worked to figure out what was wrong with the hawk. The bird had a laceration that Lindsay staff cleaned and treated and radiographs revealed a fracture in his leg which was causing him to have trouble hunting. This left him emaciated but after a few weeks of medication, care and rest at Lindsay the red-tailed was ready to be back where he belonged: The wild! CRUELTY TO WILDLIFE: A river otter was seen at the Shadelands Business Park in Walnut Creek on a Sunday in January. Disoriented and wandering around, it took over an hour for rescuers to catch this otter, who was clearly not well as he coughed and struggled to breathe. Once at Lindsay and examined, wildlife hospital staff found that the otter was missing teeth and had damage to his mouth. He was also blind in one eye and therefore would not be able to catch prey. The most humane action for this otter was euthanasia, a decision that is always difficult. Prior to that decision, staff did x-rays and were horrified to find multiple pellets in the otter’s neck and head. Though there were no visible wounds, he had clearly been shot at multiple times. In copies of the x-rays below, you can see the little pellets this poor animal was “living” with. While we never WANT to euthanize an animal, we are grateful he was brought to us so he would no longer suffer. While we have no idea who did this and likely will never know, we wanted to share this story for two reasons: 1. To ask you all to share it so that people think about their impact on our local wildlife and to teach your children, friends etc. that harming these animals is cruel. 2. We want to remind you that bringing animals to Lindsay, while they all may not make it, means you are taking them to a safe place that can, if necessary, help end animal suffering. While the animal had obviously been “living with” the pellets for a while, there is the possibility that the shots lead to the other facial damage either through direct impact or because they had compromised the otter. In cases like this, the perpetrator can rarely be traced because the shots could have happened a significant distance from where the otter was found. If anyone witnesses illegal activity regarding wildlife they should call CALTIP: 1.888.334.2258 – CDFW’s hotline. Weighing less than half a pound, this Western screech owl was brought to Lindsay Wildlife Rehabilitation Hospital earlier this month after he was hit by a car. Found in Martinez near Alhambra Valley Road at night, the caring individuals who rescued the owl kept him in a box overnight until they could bring him to the hospital in the morning. Quickly stabilized by our veterinary team, they determined he suffered head trauma, as well as scratches on both corneas. These were serious findings for this small owl because flying and hunting in the wild depends on good eyesight and balance. We are happy to report that with medication and care, we expect him to make a full recovery! Right now, this little patient is being rehabilitated with one of our veteran home care volunteers, along with two more screech owls who sustained head and eye traumas caused by similar collisions. We hope to release all three owls back into the wild once they are fully rehabilitated. Until then, the care and rehabilitation of animals like these screech owls comes at a cost. For our Martinez owl, his medical expenses will be over $1,000. The medical and behavioral services of Lindsay Wildlife Hospital exist because of our kind-hearted, generous donors. On this Giving Tuesday, please consider donating $49 to cover one day of care for this screech owl. A donation of $343 covers a week’s worth of care for the owl. Won’t you please give now and help this small patient fly free? Watch our video where Dr. Allison Daugherty performs an exam on the Western screech owl. A big brown bat was brought to Lindsay in July after it was found near a children’s splash park in Clayton. After being brought to Lindsay and transferred to one of our bat specialist for home-care, she noticed that the bat was not getting better. He would eat and then not eat, and started showing neurological impairments. A great horned owl nestling was brought into Lindsay’s hospital on March 25 after it was found on the grounds of a local golf course. Staff determined that the owl was too young to be out of the nest and during their exam found that the bird had been fed a poisoned rat or mouse by its parents. It was started on a 28-day treatment of special medicine for victims of secondary rodenticide poisoning. The owlet was in critical condition for several days but the hospital staff were able to stabilize it. After a few weeks, one of our volunteer owl specialists searched the parking lot and found both the mother and a sibling in the nest. The next week another volunteer found that the sibling had left the nest and was hiding in nearby bushes. After 28 days in care, the owlet was determined ready to go back to its family. It was beginning to fly and needed it parents to teach it hunting skills and to care for it until the fall. With the help of a concerned neighbor, the parents were located. The youngster was released on April 19 in their backyard and took off flying towards where its parents were calling. A very happy ending to a tragic story. Secondary poisoning from rodenticide is all to common. There are alternatives to poison to help with rodent control. The newest generation of poison has no antidote. Hawks, owls, eagles, foxes, bobcats and many other species can die from eating poisoned rodents as well as cats and dogs. First Beaver Released by SF Bay Area’s Premier Wildlife Rehabilitation Hospital in More than 20 Years! Lindsay Wildlife Experience released a North American beaver back into the open space of Benicia, Thursday January 26, 2017. And just after the team released this more than 50-pound beaver, another beaver came out of a nearby lodge and the pair swam around together! The beaver was treated at Lindsay Wildlife Rehabilitation Hospital on January 12, 2017, after he was found by Benicia Police disoriented at the front door of Joe Henderson Elementary School in Benicia. After care, rest and treatment at Lindsay doctors found that not only was he tossed in the storm but also he ingested some sort of plastic object. The beaver was transferred to Sonoma County Wildlife Rescue, which has large pools of water for beavers and otters to use while rehabilitating. Lindsay staff and volunteers are especially excited about the beaver release, because the Lindsay hospital receives one beaver per year on average, and often they don’t survive. In fact, the last beaver transferred from Lindsay was in 1996. Help make releases like this possible by donating to Lindsay Wildlife Rehabilitation Hospital! Meet this American kestrel that came to Lindsay in October. Likely found as a baby this past spring, this kestrel was kept as a pet. Her wings were cut with a pair of scissors, leaving her unable to fly. She can only jump from the ground onto low perches and has difficulty maintaining her balance. Watch our video where Dr. Guthrum Purdin displays the kestrel’s damaged wings. Fed only mealworms, which “are nutritionally worse than potato chips,” says Purdin, the Director of Veterinary Services at the wildlife hospital, the kestrel’s terrible diet led to “rubbery” bones instead of healthy ones. Hospital volunteers ensure our kestrel receives a proper diet and are also looking for another rehabilitation center, where this rescued kestrel can socialize with her own species while she molts into her new flight feathers—which will allow her to fly again. The care and rehabilitation of animals like this American kestrel comes at a cost. For this patient, her medical expenses total $2,600, and the amount increases every day she is in the hospital. The medical and behavioral services of Lindsay Wildlife Hospital exist because of our kind-hearted, generous donors. In honor of Giving Tuesday, you can donate $43 to cover one day of care for our American kestrel. You may also donate $325, which covers a week’s worth of care for our kestrel. Won’t you please give now and help our patient fly free? In early May, a baby red–tailed hawk, with downy fuzzy feathers was found on the ground and brought to Lindsay’s wildlife hospital. This bird was far too young to be out of its nest. A few days later, with the help of Lindsay volunteers, the young hawk was put in a basket and placed in the lower branches of the nest tree after seeing both parents and a sibling still in the nest. Typically the parents will feed both youngsters even though they are physically in separate “nests. This is usually where the Lindsay story ends—but this time it didn’t. Volunteers monitor these reunites to be sure parents are taking care of the babies. Volunteers learned that people living on the property, worried that the parents weren’t feeding the young hawk, began feeding the bird several times a day. The bird was brought back to the Lindsay hospital for an exam on May 21. The hawkwas found to be thin and dehydrated and unusually comfortable around humans. He was placed with another red–tailed hawk so he could learn to be a wild bird. Unfortunately, every time food was brought to the hack-box, the bird was waiting and eager for human interaction. His behavior continued to show that he was far to habituated to be released into the wild. 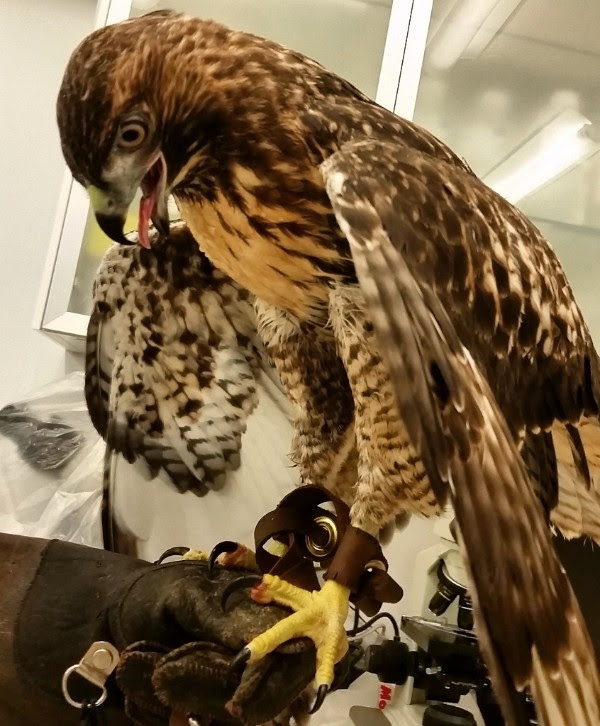 According to Sherrill Cook, interim hospital manager, the red–tailed hawk will now become an educational ambassador at another facility and will never know the wild life that it should have had. To aid in the bird’s new life as an educational ambassador, the animal encounters team at Lindsay stepped in and made anklets and jesses so the bird can be glove-trained. The hawk has been transferred to Nature of Wildworks in Topanga, Calif., to begin his new life as an ambassador for his species! While returning animals to the wild is always Lindsay’s goal, there is a silver lining, Cook said. Found at Pittsburg High School, this Red-Tailed Hawk was unable to fly and brought to Lindsay Wildlife Rehabilitation Hospital. With minor wounds—and no knowledge of how the bird was injured—hospital staff and volunteers helped the bird recover with medication and rest. They noticed that many of the birds feathers were so badly matted that imping was necessary for the bird to fly effectively. Imping is a process where a damaged feather is repaired by attaching part of a new feather. This method dates back to as long as falconry has been around—circa 700 B.C. Hospital staff replaced the bird’s broken feathers with those of a donor bird by inserting the donor shaft into the bird’s original feather shaft—think of it like an avian weave! The next time this hawk molts, it will drop these falsies and replace them with its own perfect, new feathers. A hospital volunteer helped shape the wooden insertion sticks that held the feather in place. The bird was placed under anesthesia and monitored as wildlife technicians worked to insert about 12 new feathers. The procedure was a success. Lindsay Director of Veterinary Services Dr. Guthrum Purdin, Wildlife Technician Marcia Metzler and Dr. Kathy Hamilton released the bird, brand-new feathers and all, and watched it fly into the sky over Quail Ridge Dec. 14! I have been a Lindsay Wildlife Rehabilitation Hospital volunteer and donor for 15 years. I have helped nurse thousands of animals back to health and released them into the wild. But it wasn’t until this past summer that I fully realized the miraculous work Lindsay Wildlife does. I was part of a team that helped save a clutch of baby barn owls. For the first time in Lindsay’s history, we hatched a barn owl—a miracle from egg to sky! In May, I went to the hospital for one of my weekly shifts and learned of a nest of baby owls, three hatchlings and two eggs that had fallen out of a tree. A member of “the Barn Owl team,” I asked Lindsay staff if I could take the eggs and try to incubate them. Several days later, I heard peeping from the egg! I even watched an owlet peck his way out of his shell as I sat in my San Francisco office, thanks to a webcam. Unfortunately, the first hatchling didn’t survive. I held out small hope for the remaining cracked egg. I was shocked and excited when just a few days later, a perfect gremlin-like baby owl—patient 2458—emerged. In the weeks to follow, our Barn Owl team enthusiasts, led by Annette Wolf, took turns caring for the baby at our homes. Volunteer Amy Eber fed the owlet minced up mice meat every few hours, and Darlene Silver took charge of his siblings. We updated each other constantly on the status of patient 2458, and shared daily photos. He spent most of his time in an enclosure looking at his reflection in a mirror. On June 20, he had mastered eating and was delivered to my home to enter the final stage of his rehabilitation as a pristine, white, fluff-ball. After a month of living with foster siblings in a hack box, I opened the box, and he left that very night. It was a bittersweet moment. He was gone. But all the months of hard work had paid-off. This is the best we can hope for—a miracle we helped create. Human progress can be a detriment to our wild neighbors. But we can all do miraculous things. There are no guarantees of what happens to our patients once they are released. After the baby fledged, I would go out late at night and throw mice near the hack box. Those smart barn owls would be there in the trees watching and waiting. I would smile, not knowing which one was patient 2458, but feeling satisfied and fulfilled that we had given him a chance. We need your help to continue our important work. By making a gift to the Lindsay Wildlife Annual Fund today, you will help us create chances for animals like patient 2458, and with more than 6,000 patients to treat this year, we need all the help we can get. On behalf of everyone here at Lindsay, thank you for considering a gift today. Help Lindsay volunteers and staff create more miracles like the baby barn owl. We treat even the smallest patients here at Lindsay! This Ring-necked Snake came to us from Rodeo. This cat-caught snake luckily didn’t have any overt wounds—other than some dents in the scales—but cat bites and claws can transmit bacteria through hard-to-spot punctures. After being treated for possible infection and held for a few days of observation, the snake was sent to home care and then released! Weighing a whopping 0.9 grams, it certainly takes the cake as one of the smallest patients ever seen in the Wildlife Hospital. From big to small, our hospital does it all! This little gopher was caught by a cat in October in Walnut Creek. On physical exam, he was emaciated and found to have two large lacerations, plus a broken wrist. Ouch! Sent to surgery, the wounds were sutured and veterinary staff splinted the wrist…crossing their fingers that he wouldn’t chew the bandaging off. Since the surgery, he’s been putting on weight, the wounds are healing, and he’s been racing around his enclosure—too fast for the camera to get a non-blurry picture! If all goes well, the bandaging can come off in another week and then preparations can be made for release. Good luck, little gopher! Featured Patient: Marmot Long Way From Home at Lindsay! It’s not every day that a Yellow-bellied Marmot from Tahoe shows up on your doorstep! That is what happened to a family in the Oakland hills this past week. It is highly unusual for a Marmot to be brought into Lindsay Wildlife, let alone be found in the Bay Area, since they are native to the Sierra Nevada Foothills. This little fellow was found cowering behind a pot on the patio of an Oakland home. The homeowner’s cat was following him, but thankfully, he was not harmed. After efforts to feed the Marmot were unsuccessful, the rescuer brought the animal to Lindsay Wildlife Rehabilitation Hospital. The young Marmot was admitted to the hospital in good overall health. He was slightly dehydrated, had worn pads on his feet, and thinned hair on his back, but Lindsay Wildlife’s Resident Veterinarian Dr. Guthrum Purdin said these symptoms were all expected from the animal’s long journey. It is not unusual for a Marmot to hitch a ride in the underside of a car. In fact, the U.S. Fish and Wildlife Service has a program to reintroduce Marmots and Chipmunks who are often displaced back into their natural habitat. On July 21, Lindsay’s Marmot was transferred to Lake Tahoe Wildlife Care, Inc. that recently released another stowaway Marmot back into the wild. Lindsay Wildlife appreciates every animal rescuer who brings a hurt or lost wild animal to the Wildlife Rehabilitation Hospital. This particular rescuer was even willing to drive the lost Marmot back to the Sierra Nevada area after treatment. Caring animal rescuers are the reason Lindsay Wildlife treats more than 5,000 animals a year. Please help us help them and consider a donation today. Patient Story: Mama O. Recovering at Lindsay! Look at this mama! She came in to Lindsay Wildlife Hospital June 27 from Pittsburg. Her mouth was caught on a cage.The wound was very deep, down to the bone, but with treatment and care surgery was not needed. “She came in with little beans in her pouch and now look how big they are!” Said Associate Veterinarian Lana Krol, DVM. So far the team has counted nine babies! Mama O. Almost Ready for the Wild! When she walks around they just scramble to keep up with her. “We’re excited that they’re growing and that she looks so well, and we’re hoping to get her back into the wild in the next month or so,” said Krol. Mama O. has been enjoying her TLC here at Lindsay, Krol said. It is this kind of work that makes Lindsay so important. To save these wildlife animals, and their babies, is important and Lindsay is often the only option. Consider donating today. WALNUT CREEK — A Golden Eagle, tracked as part of a study by East Bay Regional Park District, was brought in to Lindsay Wildlife Rehabilitation Hospital March 27 after fire fighters in San Ramon discovered the injured bird. The eagle, believed to be a young female, has head trauma and possible rodenticide toxicity – this occurs when eagles eat small mammals that have ingested rodent poison and then will suffer secondarily from the anticoagulant properties of those toxins – according to Associate Veterinarian Lana Krol, who originally treated and examined the bird. This Golden Eagle, a species the hospital maybe sees eight a year, may be a good example of the dangers of rodenticide, Krol said. But this is no regular eagle, it came in with a story; namely an East Bay Regional Park District tracking device on her back. Known as satellite telemetry, the bird is part of a study by EBRPD Wildlife Manager Doug Bell. The eagle was found by San Ramon Valley Fire Protection District Firefighter Team 34 at Station 30, after residents knocked on the fire station door alerting them to an injured eagle outside. Firefighter Chris Connley along with Firefighter Eric Sabye went out and found the bird sitting on the sidewalk. Soon Contra Costa County Animal Control came and together they helped to catch the sick raptor, Connley said. The bird weighs about 11 pounds, and upon follow-up examination Monday, Lindsay Wildlife Director of Veterinary Services Doctor Guthrum Purdin, could see blood in the eye indicating head trauma as well as a loss of sight in the left eye. While there do not seem to be any other major injuries and the eagle has improved, Purdin is optimistic but on guard about the bird’s chances for release. “My main concern is that the bird regains neurologic function,” he said. If the eagle improves, then there will be flight and live prey tests before hopefully she is released back into the wild, but that is at least 30-days away, Purdin said. Carol Lombard, Lindsay Wildlife rehabilitator, who helped treat the bird Friday, said typically eagles are brought in because they have been badly injured by the wind turbines in the Altamont Pass and are too far gone to save. In fact, that very issue is why this Golden Eagle was being tracked. A satellite GPS monitor backpack on the bird indicated she was being monitored by the East Bay Regional Parks District, which uses satellite telemetry equipment to track various raptors. This young eagle was originally trapped in the Morgan Territory in east Contra Costa County in January 2013 and had a GPS tracker placed on her, said Doug Bell, Wildlife Program Manager for the district. She is part of a study to track her flight path in the Altamont Pass Wind Resource Area, to help develop more accurate risk maps to inform where new wind-energy turbines should be placed, he said. “Our goal is to help reduce the impact of wind turbines on eagles, it’s very timely and a race against time,” said Bell, noting wind developer’s requests to Alameda County to repower their wind farms. The Altamont and Diablo Range area has one of the largest concentration of golden eagles anywhere in the world, according to Bell. From the GPS tracking, Bell can see that this young Golden Eagle has kept mainly to the northern Altamont Pass, Mount Diablo and the Dublin Hills. “Her movements have been more local than some of the others,” he said.